A type of asset that you literally can't live without these days is a good collection of textures. No matter what you do regarding digital art, working with simple textures will make it hard to achieve realism on any render. For architectural visualization artists using Blender, it is critical to have good textures. With the upcoming release of Eevee and the new Principled BSDF shader for Cycles, you will need good textures, with multiple maps to get better visual results. 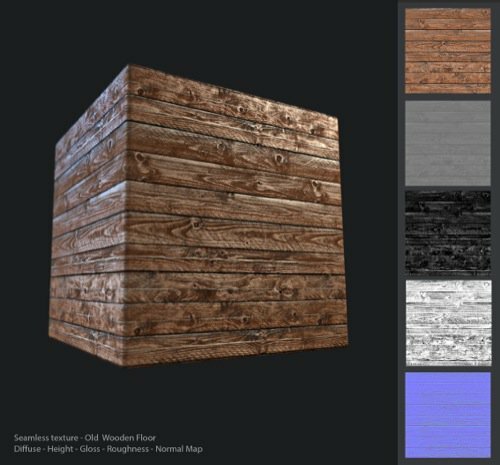 Do you want to download a free wood texture for architecture? An artist called Black Dart made an old wood texture using substance designer and shared it on his ArtStation page. You will notice that the download link is a shared file from Dropbox. Try to download the file as fast as possible, because the artist can remove the link at any time. Don't miss the opportunity to add this incredible set of textures to your library. Do you want to receive more assets like this one straight to your inbox? You should consider our Premium Subscription here in Blender 3D Architect. As part of the subscription, we will send assets, 3d models, textures, downloadable guides and tutorials for architectural visualization. You will receive the assets in your inbox four times a week! If you want to take a look at what types of assets we sent, visit this link for all content reports.